When it comes to guilty pleasure we are fully aware that having a sweet tooth is mandatory. So, we decided to give you the best recipe that will be a total delight involving caramel wonder and balsamic vinegar. Our caramel mousse with original Balsamic Vinegar is here for you! Ingredients: refined sugar 400 g., eggs 100 g., raisins 50 g., isinglass, cocoa, cream and Balsamic Vinegar of Modena. 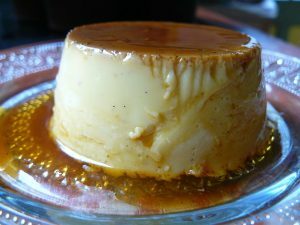 Soak the isinglass into the cold water, meanwhile boil the cream and caramelize 400 g. of the refined sugar. Add the caramel to the boiled cream. Beat the eggs with the remaining 50 g. of sugar and incorporate them to the cream. Add the isinglass into the cream and mix until it melts. Wait for the compound to cool down and pour it into the molds and put them into the fridge. Mousses are now ready and now you can decorate them. When they are cold and hardened garnish them with the raisins previously soaked with the vinegar and also with balsamic glaze. Your mousses are absolutely ready and we know that maybe you don’t want to wait but we are also sure that our c caramel mousse with original Balsamic Vinegar are worth the waiting. Buon appetito! If your curiosity has not yet been satisfied and you want to try new exquisite recipes with this extraordinary product, take a look at the “recipes” category. You will find different ways to use Balsamic Vinegar of Modena. You do not miss the chance to read some curiosities about this extraordinary and unique product in the word.